Stireman lab. 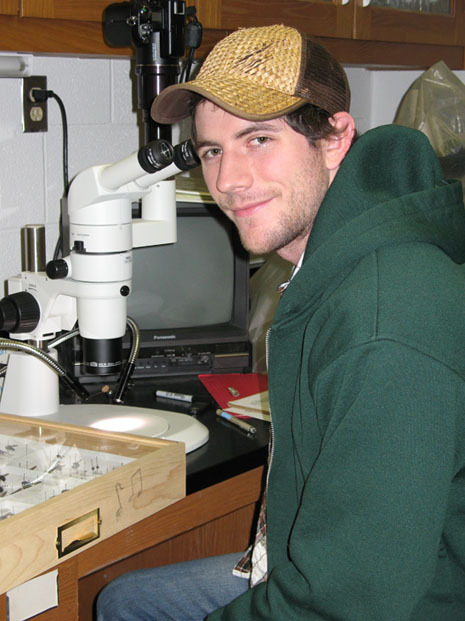 Many undergraduate students have worked in the lab on topics ranging from surveying insect diversity in the field to molecular analyses of population structure. All have gained valuable experience and insight into the process of scientific research. If you think that you might be interested in a career in biological research, whether directly after graduating or via graduate work, getting experience working in a lab is indispensable. Please contact me if you are interested in joining the lab (john.stireman at wright.edu). One great way to gain laboratory research experience and earn credit at the same time is to enroll for Laboratory Research Experience for Undergraduates (BIO 4990). Students can sign up for varying numbers of credit hours and projects can last just a single semester or for several semesters. Projects are typically designed in consultation with professor Stireman and involve hands on research, literature reviews, and a final write-up of the students activities. Students often work closely with Graduate students or Postdocs in the lab on their current projects. A more intensive research immersion can be found through the Biological Sciences Honors Program. Students receive credit for this research experience which typically takes a year to complete. Honors projects tend to be more extensive than laboratory research credit (above) and students are expected to work on semi-independent projects. This research culminates in a substantial final paper and special presentation to the Department in our honors colloquium. Students must be accepted into the Honors program (with a minimum GPA of 3.5), and a research proposal (developed with Dr. Stireman) must be approved. If you are interested in this program, you must get an early start planning it, typically in your junior year. Frequently there are opportunities for small grants to fund this research. See the Honors Program website for more information. Occasionally paid undergraduate research technician positions are available in the Stireman lab. These are typically advertised through WSU’s student employment website, where descriptions of the requirements and duties are given. Volunteer opportunities working with mentors are always available in the lab if paid research technician or credit for research experiences are not options. These always have the potential to turn into more formal arrangements. Please let me know if you are interested. This is how I got started working in a laboratory as an undergraduate.